comes the colorful Sr. Catherine, bedecked in her handmade sweater and cap, undaunted by Minnesota cold. 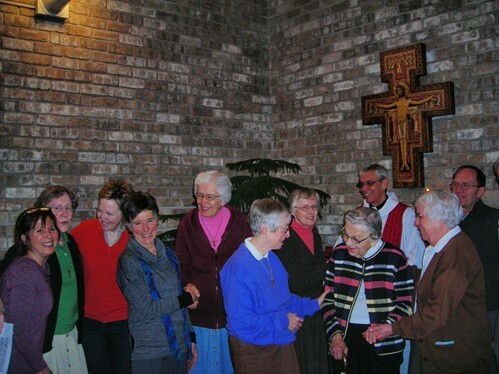 Our chapel is anything but cold and colorless as the Sisters pass the peace with daily worshipers. 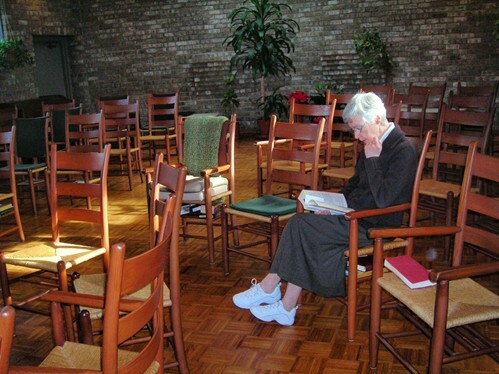 In a chapel scape of empty chairs Sr. Kate is content in her winter reading. Leader begins: Let us praise the Lord of days and seasons and years, saying: Glory to God in the Highest! All respond: And peace to God’s people on earth! Leader: Our lives are made of days and nights, season and years, for we are part of a universe of suns and moons and planets. We mark ends and we make beginnings and, in all, and we praise God for the grace and mercy that fill our days. Reading from the Scripture, Gen. 1:14-19; 26-28a. During the singing come forward and place your vigil light on the stand by Our Lady. Let us pray for God’s blessing in this New Year. You are our God, abiding with us for ever and ever. 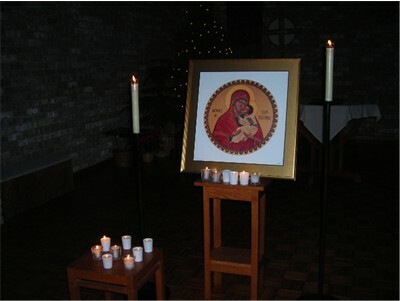 The Icon of Our Lady of Compassion was written by Sr. Mary Charles, OSB, St. Scholastica Monastery in Duluth, MN. The very large original is venerated in the Adoration Chapel at St Olaf’s Church , downtown Minneapolis. Earth and sky are connected in this photo by Dale Kaminsky of Kearney, Nebraska. In the photo we see lightning over a village, or a village calling forth lightning. 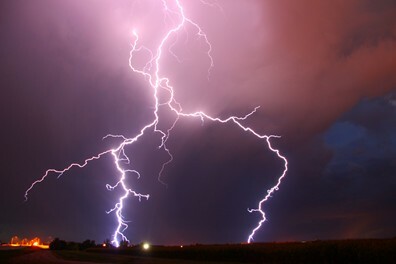 For some people lightning could be a frequent experience that lights up the sky and passes in a moment. Or depending on your perspective, you might experience a cosmic moment of connectivity when the electrical energy in the atmosphere seeks a partner with the opposite charge, and equalizes the atmosphere with a show of light. 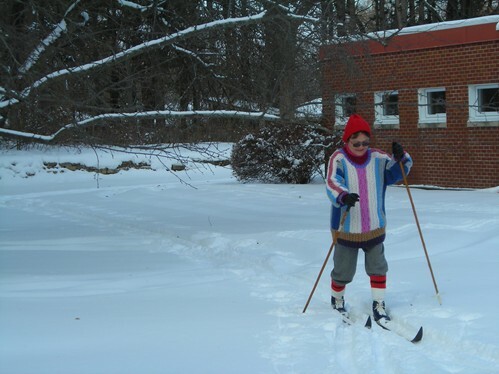 When two of our Sisters saw Dale’s photo on CNN, they looked at one another and said “Christmas!” Sister Gabriel contacted her nephew and he agreed enthusiastically to let us use his photo for our Christmas greeting this year. One Sister looked at the photo and saw the Word of God made flesh in a small town named Bethlehem, the sky alight with signs and wonders. For another Sister it was a dramatic demonstration of cosmic beauty that only now scientists are beginning to understand. We see the little town and the great force of energy; the ordinary and the unusual. The photo could be prompting our inner world, nudging memories and feelings from the past. Or it could be calling our imagination into the future when ordinary people will ride a space craft beyond our atmosphere. It might be an invitation to ready ourselves to move from this life into the spiritual realm of life beyond death. For all who are in awe of theology in conversation with scientific study, this is a reminder that theologians and scientists for most of the centuries following Christ’s life on earth worked closely together to express the reality and wonder of life. The First Christmas was an open system, that is, people in their environment exchanging and sharing with one another: the Child, Mary, Joseph, shepherds and kings. Animals provided not a small amount of chaos, entertainment and warmth. The Spirit of God works in openness and confusion. God is with us. Rob and Lynne are part of our larger community. They worship with us and help with Chapel decor and computers. Shortly before this photo, our very large Douglas Fir at the back of Chapel decided to “walk.” Fortunately no one was in its path. 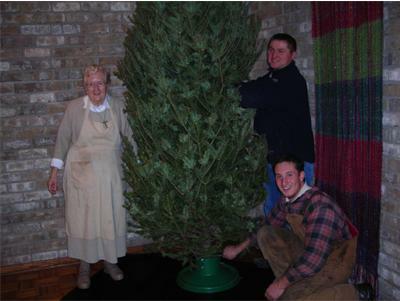 Bill Weldon came to help, and Rob and Bill got the tree standing again and the lights on. 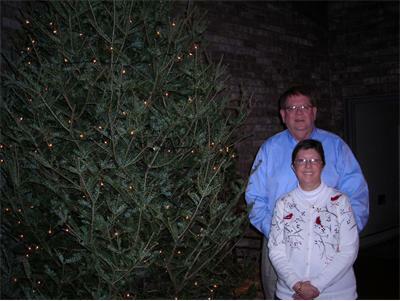 Oleg and Cole brought the Christmas trees, gift of Gary and Jane from Pahl’s Nursery in Burnsville. Sr. Gabriel supervises the raising of the trees.